Something which i think most people - who are trying to recover or have recovered - will agree on, is that Recovery takes time. When i first got admitted to the kids psych ward, i remember them saying 2 months minimum... but they said that in those 2 months, i would have permissions home and start living my life... In 2 months? not really. After a month in there though, they started talking about something like 6 months minimum as an inpatient.... i was still on complete bedrest and was then put on NG feeding. After 8 weeks of that treatment, which was just having the opposite effect on me. My family and I moved to Sweden where i was admitted to Mando. When i started there, i remember hearing that one girl, who was an inpatient at the time had only been there c.a 2 weeks and she was about to become a day patient... so i then thought... 2 weeks. Ill be out of there. That wasnt the case for me.... i think in totoal over 1,5 years i spent 7/8 months as an inpatient.... Not exactly 2 weeks? but the truth is... when you start recovery you have to give everything, give up everything for minimum a year.... there is no quick way in recovery. There is no cheat, no short cut.... the short cut just leads back to sqaure one. Trust me. It can happen that after 2 months, you feel healthy... think you can do it yourself... think you can manage, you might be able to for a while, but you will come crashing down... not necessarily... i will be very surprised and impressed if someone has managed to break off their treatment after a few weeks and mange to become healthy With a healthy weight. You have to go through the different stages, you have to start off slow... taking things easy. Just getting into the routine of eating. And then in time, start tackling realy life. Getting back into life. 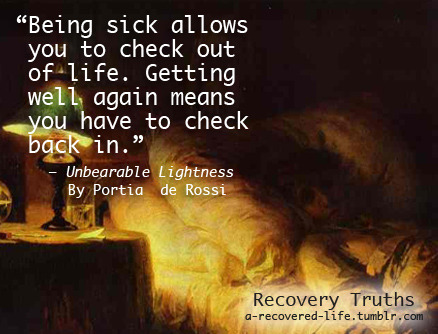 I am sure most of you can agree that, you expected to be recovered and healthy after a month or so.... it usually takes longer. There is also the mental thing... yeah sure, you can have a BMI of 19... gained weight and have a healthy weight...that does not mean that you are healthy. Anorexia, or any eating disorder is in the head. It is a mental illness. That is something which many (who are not sick) forget. They think that if you suddenly eat again... or have a half ok weight.. then your healthy... NO. And that annoys me... because it is all in the head. If you are feeling mentally unweell, depression, loads of anxiety, panic... still hate eating but eat anyway. Then you're nto healthy, no matter what your weight. But working on your mental health is usually something you have to work with alot on your own. To spend time thinking positive. Writing down good things. Aims and goals. Telling yourself you look good. Recovery takes time, and i am going to be honest and say... you will have to give up a year or more of your life, and focus solely on your recovery ,on your health... everything else can wait. And its hard to hear... but this is your life. This is your health... a year, is nothing compared to how long you will live if you recover? And think about it like this.... one year in recovery.. could stop the rest of your life being sick? How many years of your life have you spent sick? 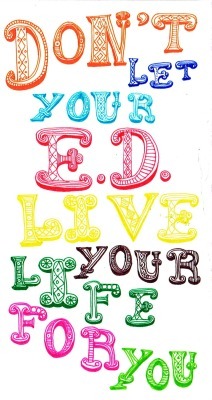 dont you want to start living now? Doctors and staff will usually say it will take somehting like 2-6 months... and it can do that. So dont not believe them. If you are ready to recover and willing to challenge yourself, to go all out... to stand out with the anxiety and really recover... it can go quickly. If you are willing to keep being healthy...to not just fight to get out of the treatment centre and then start your sick behaviious again? But dont ever think twice about asking for help or seeking treatment... never. 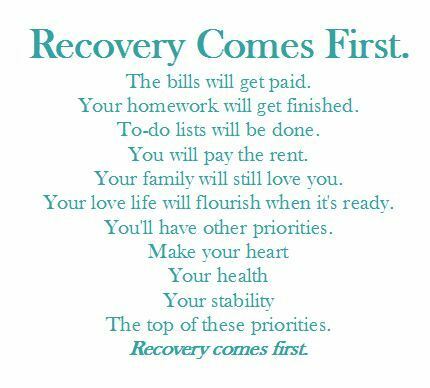 Recovery will be one of the best things youve done in your life... the best choice you can make.